Cleantech Invest Oyj portfolio company Nuuka Solutions has decided to investigate the possibility of listing on Nasdaq First North Stockholm. Cleantech Invest has previously announced that the main focus this year is getting several portfolio firms listing ready. Earlier in the fall Cleantech Invest portfolio company Enersize also announced its listing intentions plans. Nuuka Solutions will now select the advisor to handle this process. The listing is planned to take place during 2017. Cleantech Invest’s effective fully diluted ownership in Nuuka Solutions is 35,2%. Nuuka is a leading building management solution provider headquartered in Finland. Nuuka`s SaaS based software consolidates existing building big data into one single user interface and helps building owners and users to not only report but also analyze and understand the core reasons behind energy efficiency, good indoor air and sustainability. Nuuka empowers the users and brings building big data from the cellars and only for the experts to the users and owners of the buildings and thus enables better building management and increased property values. Nuuka has recently announced that it is entering the Chinese market together with a well-known Chinese energy efficiency company and that it has started targeting the real estate markets in Belgium and the Netherlands. 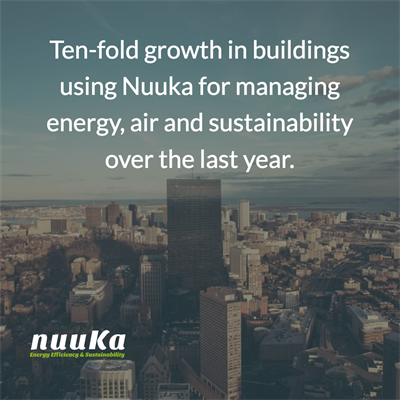 "We have been growing several hundreds of percent this year and feel like we have proven our value to our customers with 700+ buildings using Nuuka currently. Now we are looking to raise capital to speed up our growth not only in our home markets here in the Nordics, but also in the Benelux area, where we already have 20+ major office buildings under management, also in China and possibly in the US. We feel that First North Stockholm listing would be a great step on this interesting journey".